Sooner or later, most games collections will seem to include at least one Lovecraft themed game. Given that I’ve long been a fan of Call of Cthulhu and the whole mythos in general, it’s taken me a surprisingly long time to get around to this milestone. Anyway, birthday’s role around and I found myself in possession of a shiny new copy of Arkham Horror. Stabcon this weekend, and for the first time I’d booked a full weekend ticket rather than just the Saturday. Whilst I didn’t actually manage to make it on the Friday due to having to run a few last minute errands, a fairly epic Saturday, and quieter Sunday more than made up for it. Monday at work was a lot harder than normal, and booking the day off may become a thing I do the full weekend again. Northern Afghanistan descends into chaos as the Warlords keep forgetting to stay quiet! 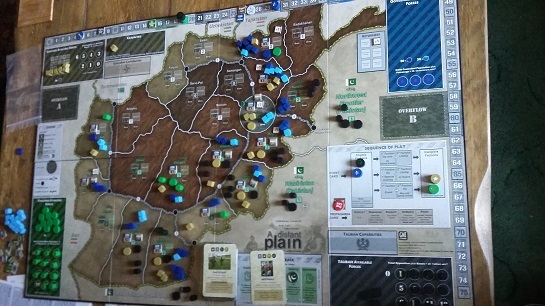 I was given a copy of A Distant Plain for my birthday last year, having asked for something a little more political and of a chunkier length than many of the board games I already owned. The problem was, the time required to play even the short version seemed daunting and finding people willing to give it a go was proving problematic. Thankfully this weekend a few friends were willing to give it a try, and whilst they were less than enamored with it, I’m pretty convinced that it is the game I was looking for. Afterwards I went home and had a look at things again and I think I understand it more now. I’m probably going to pick this up again and give it a run though – but yeah, I read this back well Il Douche was just a possible joke rather than a reality. How are we? Good, good. Keeping well? Glad to hear it! Me? Things over here have been busier than usual, and I’ve not really had the time or energy to sit down and write anything beyond emails to people explaining why they can’t build death traps even if it is cheaper to build that way (although not in the long run when the court cases begin), run up and down the country to various jobs here, there and everywhere and then try to stay sane at the weekend. However, it’s a new year and I thought I’d make the effort to write a bit more, although I’m not entirely sure what about. So, let’s start with board games. This weekend gone was the excellent Winter Stabcon. Now being less than 500m from my bed it would be rude not to attend and I did get to play a few things whilst I was there. Board gaming seems to have become the most frequent sort of gaming I’m involved in these days as there’s little planning needed. Didn’t manage to get a game of Quartermaster General in, but that was the only downside of the weekend. Games I did play! Internal Affairs. A neat little card game based around cracking numerical codes and trying to figure out which side your opponents is on. Not sure about the longevity of the game ( I suspect that it plays better with more players), but a nice one to have around for between meatier fare.